A new blackmailer variant email with new transmission characters was captured by Antiy Threat Situational Awareness System on December 2, 2015, which was guided by a JS script in compressed package rather than spread by sending binary file load directly. Antiy PTA group has made an analysis of related incidents and samples. 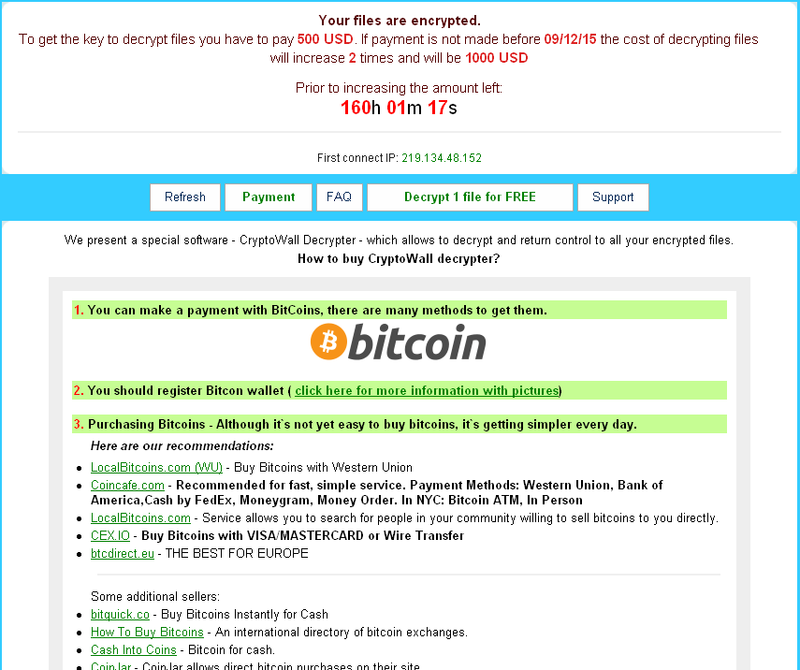 This sample is TeslaCrypt 2.x, a variant of TeslaCrypt. A zip file near to the mail is unzipped to a JS script. After JS script is executed, it will download TeslaCrypt2.x to run, traverse computer files and encrypt 186 kinds of suffix format files, including documents, pictures, audio and etc. After the encryption, it will open blackmailer’s homepage to blackmail and ask for 500 USD to decrypt within a specified time. If overdue, 1000 USD is needed. 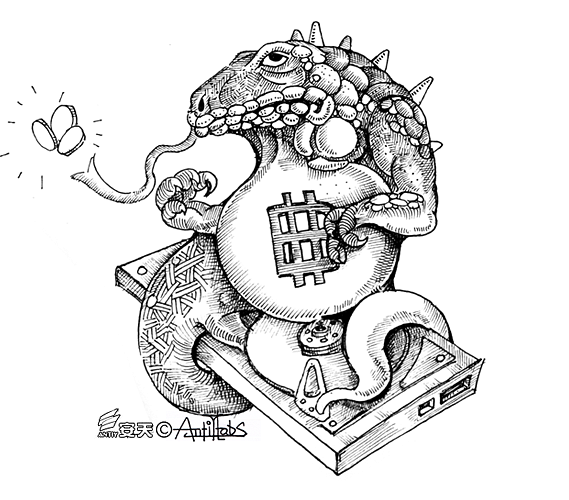 As TeslaCrypt2. X variant changing the way of key calculation with the ECDH algorithm, hackers and victims can negotiate a key without sharing any secret. TeslaCrypt decryption tool released by Cisco  has been unable to decrypt. It uses “Hello” to address rather than a specific name. The text body is “Please check the attachment, E-mail documents will be mailed to you and this electronic version is sent to you for your convenience “. In order to show the importance of this email, blackmailer emphasizes that the mail is sending by a traditional way.Thus, the recipient may regard it as an important one and check the attachment. 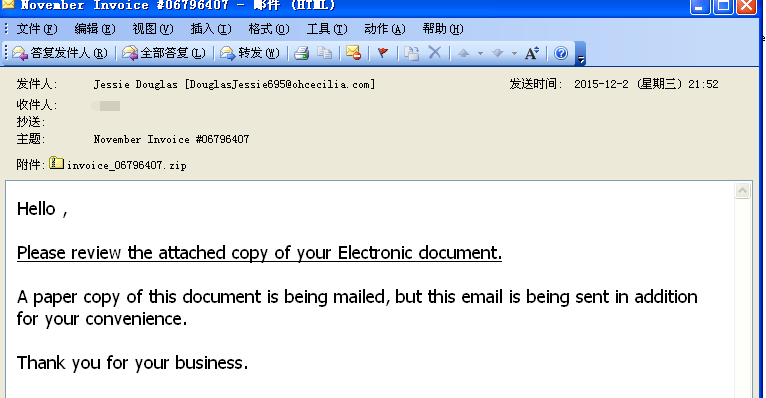 E-mail attachment is invoice_06796407.zip, unzipped as INVOICE_main_BD3847636213. 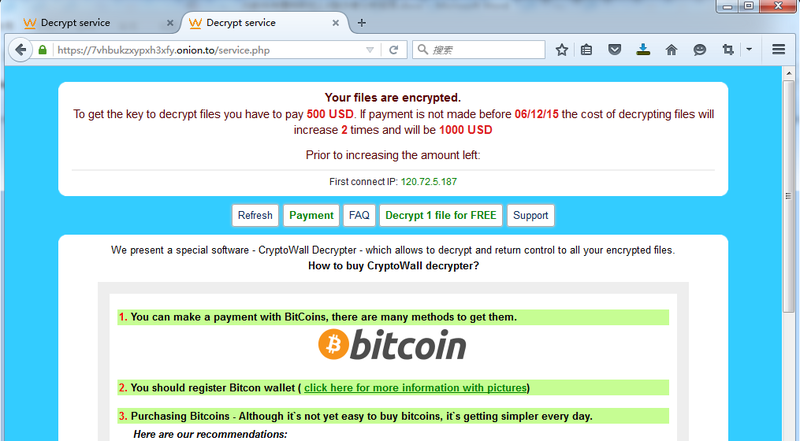 js file which is a downloader used to download TeslaCrypt 2. X and execute. This variant is similar to previous malicious act in Tesla report and can take another security team IsightPartners’s report for reference . After the samples being executed, it will AES256 encrypt the document, save the recovery file required information to the registry and text files and sends related information to Tor server controlled by hacker. (2) Start threat traverse process path, if the path concludes any string of Taskmgr、procexp、regedit、msconfig、ex, end related process. Thus, CMD, task manager and process check tools cannot open and thus cannot check and end malicious sample process. Visit myexternalip.com/raw to acquire outer network IP information of victim host. Finally, it will pop up a warning page to prompt blackmailer homepage visiting and key encrypted. And the keys can be got by visiting blackmailer server. 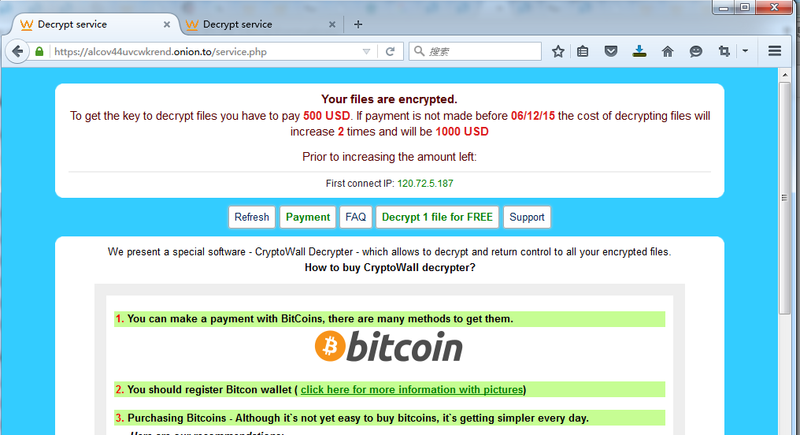 To get the key to decrypt files, you have to pay 500 USD. If payment is overdue, you have to pay 1000 USD. Antiy technicians found that blackmailer network sever hides in Tor network to avoid tracking. Clicking the page that blackmailer provided is as follows: inputing identification number can prevent automated traverse and query of victim information. After correlating data, the servers that the following URL point to are the same, which are servers of Tesla (2) x blackmailer variants and the information that queried by the same ID in these three websites is also the same. Victim IP120.72.5.187, the data that two URLs returned is the same. It also contains PDB information in C:\wrk\decrypt\decrypt\Release\decrypt.pdb. It can be got that public and private key encryption and decryption algorithm of OpenSSL ECDH is used, which also shows that it adopts ECDH key to encrypt files. 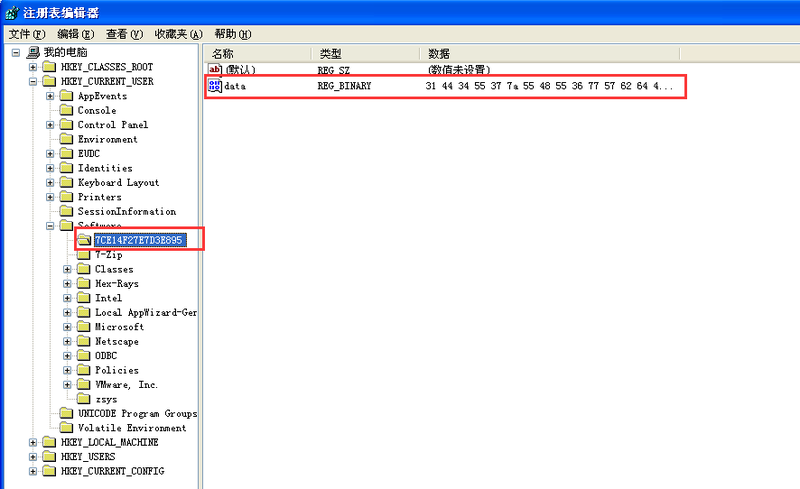 Blackmailer can spread executable PE load through email packaged software by double extension, SCR extension skills, etc. In this campaign, it uses JS format’s disguise to avoid detection and prevention of antivirus software. At the same time, Tesla 2. x blackmailer adopts ECDH encryption algorithm and puts user data in danger, rather than previous reverse get key to decrypt files. From a past monitoring, we found that the victims of blackmailer malware are from the original individual users widely to business users, or even servers. Antiy has strengthened its detection and defense ability of blackmailer Trojan in its PTD system and IEP system. As the increasing danger of data security threats, enterprise users also need to defense blind area through competency-based products and effectively improve network security awareness, build defense in depth system, and get threat information through threat information platforms timely to reduce further proliferation of risk.